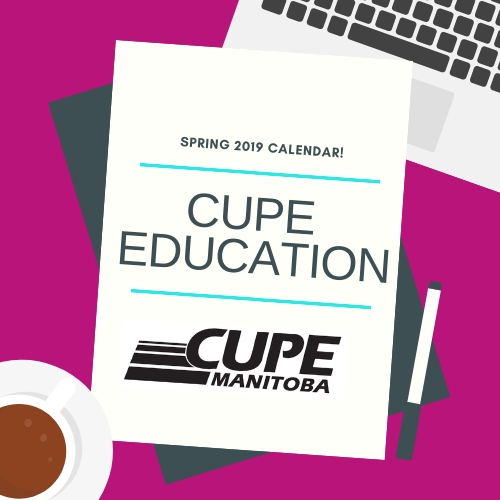 The CUPE Spring 2019 Education calendar for the Manitoba Region is now available! The program calendar is for the period February, 2019 to June, 2019. You can download a copy by clicking on the link: Schedule_Spring_Education_Workshops_Manitoba_2019. Registration for the workshops can be completed at https://cupe.ca/mrm-union-education/events/4. Should you have any questions, please do not hesitate to contact the CUPE Manitoba Regional Office at 204-942-0343 Toll free: 1-800-552-CUPE(2873).